The undersides on six bridges over Interstate 78 in Berks County were slightly over 14 feet and were routinely getting hit. They needed to be replaced to meet the current under-clearance standard of 16 feet 6 inches. A team comprised of District 5 staff and consultant engineers designed a plan to replace the bridges using accelerated bridge construction (ABC) methods, mainly utilizing pre-cast concrete components. This approach would avoid long-term traffic disruptions on I-78 and the associated side roads. The consultant firms involved in the design were: AECOM; Johnson, Mirmiran & Thompson, Inc.; Alfred Benesch & Company; and Erdman, Anthony & Associates. In late 2015, a $37.5 million contract was awarded to HRI, Inc. of State College, with a contract completion date of November 2017. 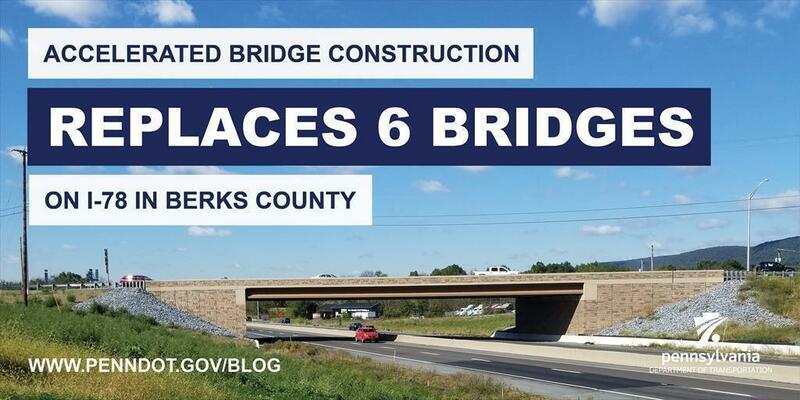 The contract stipulated the maximum length of time for each bridge closure at 40-60 days, depending on the bridge, and that any traffic stoppages on I-78 for beam removal and placement would occur at night, with each stoppage lasting 15 minutes or less. There was an issue with the form work on the underside of the first bridge, the Midway Road Bridge, that needed to be re-evaluated. Basically, the ultra-high performance concrete (UHPC) has a higher unit weight than conventional concrete or grout and therefore the formwork needed to be more robust. After the first structure, the contractor formed these areas more completely which in turn corrected the issue for the other five bridges. On several of the structures, variations of the surfaces on pre-cast pieces led to some fitting issues. Overall, these issues were relatively minor in nature and were corrected on-site by grinding the conflicting areas and issuing other spot repairs. The crews also experienced a few challenges with the maintenance and protection of traffic, mainly on the Mountain Road Bridge and to a lesser degree on the Midway Road Bridge. The challenges arose because of the department's willingness to provide reasonable access to adjacent businesses to avoid total closures of their access and the subsequent loss of customer revenue. One of the biggest challenges the on-site crews faced was when the Northkill Road Bridge sustained serious damage to a fascia beam when it was hit by an oversized load on I-78 in early spring 2017. This bridge, which luckily was set to begin construction the following month, was immediately closed to traffic by PennDOT's Berks County Maintenance. HRI was able to adapt their construction schedule almost seamlessly to accommodate the direction from the District Bridge Unit to begin work sooner on the Northkill Road Bridge due to public safety concerns. Although some of HRI's build time for this structure needed to be adjusted to account for this, the bridge was safely removed and reconstructed. Even with these challenges, the HRI team hit the milestone dates on the majority of the structures and the project was quite successful. "As with any project, some complications arose during construction," said Inspector-In-Charge Adam Bratrude. "It is a great testament to our contractor and on-site inspection staff that we were able to overcome challenges and deliver a quality project." Although the tolerances on the pre-cast concrete components caused the most significant challenges, there were no major fitting issues. Also, the weather did not cause significant delays, and uniform geotechnical conditions meant no re-evaluations on any bridge foundations or the need for major undercuts. The ABC process resulted in nominal traffic disruptions, minimal complaints, greater safety for motorists and construction workers, reduced environmental impacts from vehicle and construction equipment emissions, and shortened construction times.